NMEA 2000 is a plug and play electronics communication standard based on Controller Area Network (CAN). The network carries data sentences for commands as well as messaging (tank levels) between NMEA 2000 devices. All data transmitted on an NMEA 2000 network are organised into groups. These groups are identified by a parameter group number (PGN) that describes the type of data contained in the group. The CZone system can share certain monitoring PGN’s with other NMEA 2000 compliant devices, such as engine temps, pressures, SOG, battery monitoring etc. How many devices can I have on the NMEA 2000 network? No more than 50 NMEA 2000 devices can be connected to any one NMEA 2000 network. It is also important that there is no more than 3 V voltage drop from the power source to the device located farthest from the power source. In case there are more than 50 devices or the voltage drop exceeds 3 V, a CZone Network Bridge Interface can be installed to expand the network to a maximum of 252 devices. How do I connect an NMEA 2000 network? The main communication channel of the NMEA 2000 network is the backbone to which your NMEA 2000 devices connect. Each NMEA 2000 device connects to the backbone with a T-connector. The NMEA 2000 backbone must be connected to 12 V DC power, and terminators must be installed at both ends of the network to function correctly. Daisy chaining is not allowed. What are the power requirements on the NMEA 2000 network? Your NMEA 2000 network must be connected to a 12 V DC power supply. Do not connect the network to any other voltage source, such as a 24 V DC power supply. Supply power as close to the middle of the backbone run as possible. Do not connect the NMEA 2000 network to power in more than one location unless a CZone Network Bridge Interface is used. We advise using the NMEA 2000 cables supplied by Mastervolt. These NMEA 2000 Mini cables have a greater current carrying capacity than the standard Micro cables. This reduces voltage drop on the longer backbone runs expected on a CZone network. What is the maximum length for a drop cable? The maximum length of a single drop cable to a NMEA 2000 device is 6 m (20 ft). Can I connect other devices to the CZone NMEA 2000 network? Yes, that is possible. 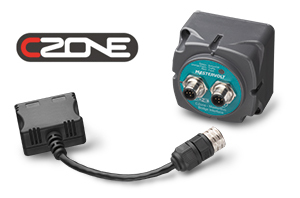 CZone devices are NMEA 2000 certified, so other NMEA 2000 compatible or certified devices can connect and communicate together on the same network. What happens if a CZone module is damaged? All CZone modules offer a true ‘plug and play’ installation. This means that, if a CZone module is physically damaged and needs replacing, you can just copy the DIP switch setting to the new module and plug it into the system. The system will recognise the module by its DIP switch setting and configure it automatically. What happens if the CZone network fails? In the event the CZone network fails, all loads that are controlled through CZone can still be powered by locating the (Combination) Output Interface, and putting the hardware fuse into the bypass position. How do I configure the CZone system? The CZone system can be easily configured from a Windows PC or laptop connected to the network with the CZone USB CAN Adapter. Can CZone be connected to MasterBus? Yes, that is possible with a CZone MasterBus Bridge Interface or Wireless Interface.